Occasionally I get invited to take part in a cookery challenge. A bit like a simplified version of Masterchef but thankfully all in the safety of my own home, I get sent a batch of ingredients and invited to make something. On this occasion, I was sent a rather wonderful but extremely complicated recipe for Scandinavian langoustine which you can read here, well in advance of the components of the dish arriving. When the ingredients DID turn up there were no langoustine and no instructions for making the smoked potatoes. Instead of the langoustine, which can be hard to source and which actually should be bought live, I’d been sent prawns. For a while I despaired but, eventually decided that my best option was to use some of the smoked fish that had already been sent to me from John at DelishFish. His smoked fish comes from the North Sea, close to Scandinavia and is cured in his own smokehouse. And it has recently won an award for innovation. My idea was to create a dish that had some Scandinavian components and inspiration from the original dish (caraway seeds, cream and potatoes). I wasn’t planning to add texture with breadcrumbs, so instead of mashed potato, I made the Scandinavian version of rosti, little potato cakes. Now, while one day I might just try the recipe from Aveqia, I’d be equally happy to visit and sample it made by the experts! I’m quite sure it would take me a lot of practice to actually produce anything so beautiful. In the meanwhile, my very simplified hake and prawn recipe with Scandinavian potato cakes made an excellent supper. Drain the grated potato, season with salt and form into flattish 'cakes', about the size of a scotch pancake. 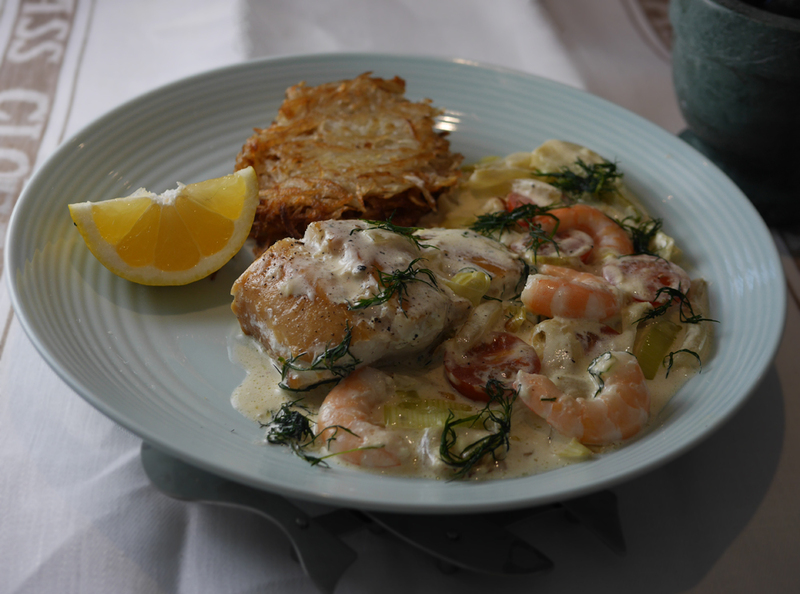 Add the shelled prawns, tomatoes, cream and dill to the pan with the hake and fennel. Continue to cook for 2 minutes. So which version are you going to try? The langoustine special, or my ultra-simple take on what sounds like a fabulous Scandinavian fish dish.